New Orleans' Preservation Hall Jazz Band, with creative director and tuba player Ben Jaffe, right. 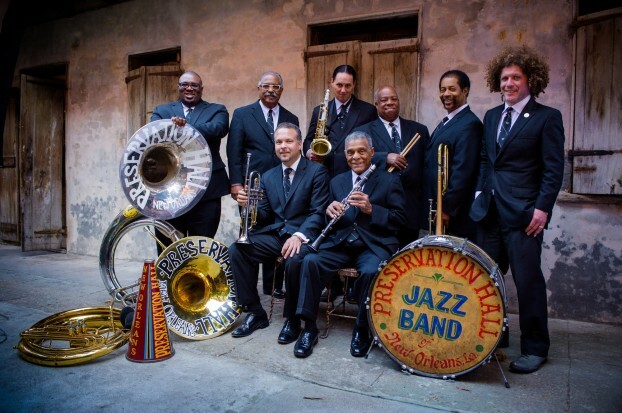 The Pickup recently caught up with Ben Jaffe, the creative director for the Preservation Hall Jazz Band, to discuss the band’s role in preserving New Orleans jazz traditions while sharing them with the world. The band is playing a sold out show at the Broadway Theatre in Saskatoon on June 22nd during the Jazz Festival. Preservation Hall has been a part of Jaffe’s life since he was born. His parents Allan and Sandra Jaffe were involved with the group of people who originally founded the Hall in 1961 as a venue to preserve New Orleans jazz traditions. Since then, Preservation Hall has become a hub for the New Orleans jazz community, with nightly shows and outreach programs. The Preservation Hall Jazz Band tours on a regular basis with a stable roster of some of New Orleans’ finest jazz musicians. The Pickup: When you take the band on the road does it change your vibe at all? You guys are kind of the unofficial New Orleans jazz ambassadors for North America. Does the New Orleans sound travel well with you when you hit the road? Jaffe: You know man, it’s interesting. You can recognize someone from New Orleans from a block away from the way they’re walking. I thought, god, you know, here we are meeting on the street in New York. You wear New Orleans like a… Actually, it’s more than a badge of honour. It’s really like who you are. It’s in your blood. So yeah, it’s like that. Wherever we go, we bring New Orleans with us. Preservation Hall is the hub of our cultural community. Your parents got their hands on the Hall in the early 60s, right? They got involved with a group of people who were creating an environment for the aging New Orleans jazz musicians, and out of that idea came Preservation Hall. What’s changed in the decades since then, for better or for worse? I don’t like to use the word change, because not much has changed. It’s evolved. We’ve evolved into third and fourth and fifth generation New Orleans musicians, you know, I think that’s a beautiful thing. Do the new, younger generation of musicians still come out to the hall and test their chops with the veterans? I participated in a project — a competition — where they pit one band against another band, sort of like an old style jam session that the crowd gets to choose the winners. It was for high school brass bands. These aren’t like marching bands you see at half time shows at a football game. These were New Orleans style marching brass bands, like the kind that play at funeral processions or at Mardi Gras parades. These were all high school or junior high kids — there was nobody there over 19. I remember watching, and it and it reminded me of when I was that age, and I first started playing with brass bands in New Orleans. And I looked at these kids and I’m like, god, it’s like looking at myself again. Our culture history repeats itself. These kids are going to bring all of their influences to it, there going to bring all of their hip hop influences, their rock and roll influences, and all of their technology influences, you know? It’s amazing. I’m not worried about the continuation of New Orleans jazz. My main thing is about protecting our way of life and protecting our traditions from the intrusion of free market capitalist society. How did Katrina factor into the history of the Hall and New Orleans jazz itself over the last couple years? That was like our World War. We lost everything in New Orleans. I mean, if you lived in New Orleans you lost something. Most of us lost our homes, we almost lost our business. Preservation Hall was shut down for a year. I’m amazed that we even survived and that Preservation Hall is still here today. I think that speaks volumes about the strength of this community and the power of community. That’s why I know that what we do is important. Literally, we made it through the storm. How long has this roster of the band been together? The band, like New Orleans, and like Preservation Hall, it evolves. Members of the band pass away, you know. But once you’re in Preservation Hall you’ve been accepted into sort of a… I wouldn’t call it like a tenured position, because we don’t use that term, but it’s like being a member of symphony orchestra. You don’t audition, you more or less really qualify. You’ve earned the stripes and you’re part of our community and you’ve earned a seat in the band or at Preservation Hall. Even when the band is out on tour performing, we still have music at Preservation Hall in New Orleans. There’s like 80 musicians who are part of our extended family. How do you put together the team that tours? Every band has it’s own identity. This is the band that I’m the creative director for, the band that does all the recording — the Preservation Hall jazz band. It’s difficult to explain because there’s nothing else that exists to compare it to. I sort of compare it to Buena Vista Social Club sometimes, because you have a lot of people who understand that set up, of Buena Vista being like a family of musicians. You all speak the same language musically, right? Do you play without even thinking about it? Is it second nature? This is music we’ve played our whole life. The only difference is that we’re not in New Orleans. That’s the thing about playing our music. Even when we’re playing our music in front of an audience, no matter where we are in the world, we still bring that same spirit to the performance no matter where we are. If you play the same tunes, how do you challenge yourself to stay fresh? People in New Orleans might want to hear the Preservation Hall Jazz Band that they know, that their parents know. But when you go on the road, how do you stay on the cutting edge? Do you even worry about that? In my mind, you have to evolve or you will become a museum piece. I never want to be a repertoire band that recreates something from the past. We are influenced from the past because our souls, our traditions have been passed down to us through our families. But we have to remind ourselves that this is a tradition that people like Jelly Roll Morton, and King Oliver, and Louis Armstrong and Buddy Bolton and people like that are responsible for creating. And every generation of musicians has a responsibility to contribute something to that tradition. It’s a matter of determining whose responsibility it is. And it’s ours. It’s our responsibility to build on the traditions in the spirit of the ones that came before us, in a reverential way that honours their memory. Can you tell me a little bit more about your new album “That’s It”? Yeah, it’s coming out first week of July. It’s actually the first album of entirely new compositions composed by the band. It was an exciting project to work on. The interesting thing to me that is when you tell somebody it’s a new composition, some people will be totally excited and be like “oh my god, I can’t wait to hear what you did.” And then there’s another group of people who are like “oh my god, what have their done,” you know? I’m really proud of the album. How do you feel about touring Canada? I’m always surprised at how much people know about us. I don’t want to generalize, but I find Canadian audiences to be very well informed audiences. Artists really appreciate when people respond to what you create but also take the time to learn more about you, and what you do, and why you do it.